The following statements are from Azure Naturals and used with their permission. VITAMIN C WORKS! Our serum will increase cellular renewal by boosting the production of collagen and elastin. Vitamin C, Ferulic Acid, and Vitamin E are all powerful anti-oxidants that when combined can provide up to eight-fold antioxidant protection, 96% reduction of sunburn cells, and prevent the formation of free radicals in sun exposed skin. Our serum is intentionally designed to be thin, but not greasy or watery. This is the optimal consistency for a Vitamin C serum and allows the potent ingredients to deeply penetrate your skin to repair sun and other environmental damage, while boosting production of new collagen and elastin. WHY AZURE NATURALS? Our ULTIMATE VITAMIN C is 100% guaranteed to be the fastest working and most effective Vitamin C Serum on the market today. Compare our ingredients to similar product from Skinceuticals, Obagi, and PerriconeMD. Not only will you find we have superior organic and natural ingredients our Vitamin C serum is $80 to $130 less expensive per bottle! More expensive does not mean it works any better! If you don’t care about wasting money, you should still buy our product because it works better! You can donate $100 you save to charity! HOW DO YOU RECEIVE OPTIMAL RESULTS? Just like exercise, it is very important to use your skin care products consistently. VITAMIN C serum can be applied twice per day in the morning and at night. If you only use the serum once do so in the morning. Vitamin C serum will help protect you against future sun damage and other environmental stressors, but it is definitely not a substitute for sun screen! Your skin’s texture should start to improve with the first application, but give your skin at least 30 days of consistent use to see the optimal results. Follow with our ULTIMATE HYALURONIC Moisturizer, ULTIMATE RETINOL, or another good moisturizer. Our Vitamin C serum is safe for all skin types and conditions including dry or irritated skin, wrinkles, fine lines, dull complexion, acne, and eczema, etc. You should not experience any dryness, but if you do you are most likely applying too much of the serum. If you have dry skin start slowly, especially around any areas that are prone to dryness. You can begin to apply more serum gradually as your skin adjusts. 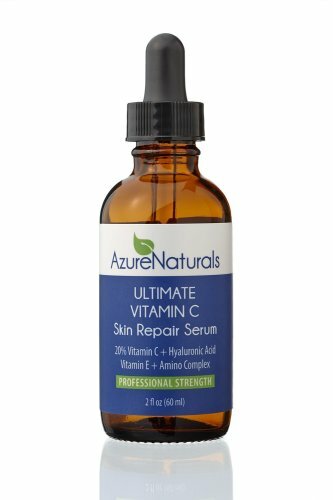 Azure Naturals has so graciously offered to sponsor a giveaway for one of their bottles of Ultimate Vitamin C Skin Repair Serum, and they are letting me choose not ONE, but THREE winners! That’s right – there will be THREE winners for this giveaway – your odds of winning just got better. You don’t want to miss this opportunity to get your hands on this amazing serum… just enter the giveaway below. I am very excited about this. I’ve heard so many great things about Vitamin C serum and have really wanted to try it, I just turned 40 and I’m really paying extra attention to my skin. The company is impressive and I’m glad it’s cruelty free and all of the other great standards. This would be my first serum. Thank you and Azure Naturals. I am new to your blog. Looking forward to getting your posts. Thank you Susan 😀 and Welcome! I love that this serum has Hyaluronic acid AND Vit C in it. I recently two separate serums, one at a time that one was vit c and one was hyaluronic acid, so I think it’s twice as good they put both in their product. I’d love to try this. I’ll be turning 47 soon and like to try new things to help slow the signs of aging. Thank you to blogger and sponsor for this giveaway opportunity. Thanks k you for this opportunity!!! I have really bad skin problems. I am hoping this will be real problem solver for me. I am not familiar with the Azure Naturals brand but the Ultimate Vitamin C Skin Repair Serum looks like a great product. I would love to try this serum, thank you for sharing this post. I love using vitamin c serum, it really works. I recently tried a serum with vitamin c and Hyaluronic acid, and love the results. I am always looking to try new products. I really like your blog and articles. I would really love to try this product! This is really great! Thanks for sharing! my skin seems blotchy, i hope this could help! My mother told me that I should try a vit c serum for some dryness around my eyes and this stuff looks amazing! This looks like a great Serum and I love the fact it contains Vit C!